East York Novice Boys U10 Win Gold Medal in Guelph! Congratulations to the East York Novice Boys U10 team for winning the Gold Medal at a tournament in Guelph Ontario! Way to go team and coaches! By eastyork|2018-01-22T09:38:40-04:00January 22nd, 2018|Novice, Rep Teams|Comments Off on East York Novice Boys U10 Win Gold Medal in Guelph! Novice Boys Win Gold at Provincial Championships!!! Congrats to the East York U10 Novice Boys for capturing gold in Division 4 at the 2015 Ontario Cup! The boys opened the tournament with a hard fought 26-19 win over Durham City East. They defeated the Chatham-Kent Wildcats (41-21) and Milton Stags (44-34) to win their pool and advance to the gold medal game against Oakville Venom. A tremendous team effort resulted in a narrow 25-24 win in the finals. The team made a tremendous amount of improvement over the course of the season. And the gold medal was a great reward for all their hard work and dedication. A big thank you to the parents and families of these fine athletes for your support throughout the season! And a special thank you and congratulations also to the coaches (Geoff, Justin, and Mark) for their hard work and dedication to the team and for making this a most memorable season for all concerned! By eastyork|2015-03-30T09:37:46-04:00March 30th, 2015|Novice, Rep Teams|Comments Off on Novice Boys Win Gold at Provincial Championships!!! Three Rep Teams at Provincial Championships March 27-29! Good luck to three of East York Basketball’s Rep Teams as they finish off their 2014/15 seasons at the annual OBA Provincial Championships in three different locations from March 27th until March 29th, 2015! First up the Novice Boys U10 team will take their success at the Blessed Sacrament Tournament in Hamilton earlier this month, where they captured a Gold Medal in their division, to Burlington, Ontario for a chance to bring home more hardware as they compete in a very impressive Division 4! The Atom Boys U11 team will also be hoping to build on their success at Blessed Sacrament, where they took home the Bronze Medal, in Aurora as they battle some familiar foes in Division 6 action. Previous results against teams like the Whitby Wildcats, St. Catherines Rebels, London CYO, and YNBA will make this a very competitive tournament. Go team! And the Atom Girls U11 team will be on the road in London, Ontario to finish off an inaugural season on a high note. After capturing their own Gold Medal at Blessed Sacrament the ladies will be looking to make some more memories as they compete in Division 4 in the Forest City. All the best! The whole East York Basketball Club will be cheering for all of these fine athletes as they represent our community with spirit and sportsmanship and have a lot of fun playing basketball! By eastyork|2015-03-24T15:58:34-04:00March 24th, 2015|Atom Boys, Atom Girls, Novice, Rep Teams|Comments Off on Three Rep Teams at Provincial Championships March 27-29! East York Novice U10 Boys Win Gold!!! 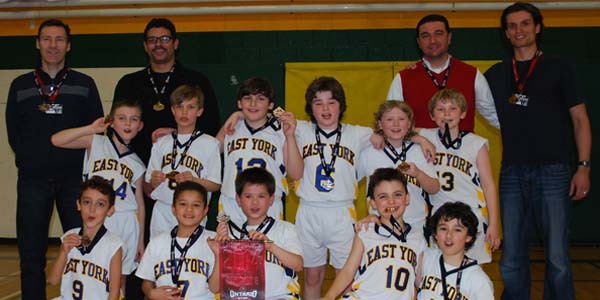 Congrats to the East York Novice Boys for winning gold at the Blessed Sacrament Tournament in Hamilton. The boys opened the tournament with a 34-25 victory over the South Simcoe Supersonics before losing a close 32-30 match to the ABC Magic. They bounced back with a 32-29 victory over the Chatham-Kent Wildcats to capture first place in their pool. On Sunday, a 30-26 semi-final win over the Cambridge Centaurs set up a rematch with the Wildcats for gold. And the boys ended the tournament with a decisive 37-15 win. Looks like the squad is really coming together well heading into the Provincial Championships, which happen March 27-29th. Good luck for the rest of the season!!! By eastyork|2015-03-11T14:33:27-04:00March 10th, 2015|Novice, Rep Teams|Comments Off on East York Novice U10 Boys Win Gold!!! East York Novice Boys Win Gold at Provincial Championship! Congratulations to the East York Novice Rep U10 Team for winning the Division 8 Gold Medal at the OBA Provincial Finals in Burlington, held March 28-30th, 2014. What started off as a raw group of very enthusiastic individuals developed into a team in every sense of the word, and the boys earned this victory through hard work, perseverance, sacrificing individual goals for the collective good, and for having a ton of FUN in the process. All parents and coaches are extremely proud of each and every player and this momentous achievement, earned with a five game winning streak to end the season. Truly a dream ending to a fantastic first year and all the credit goes to the players, with an honourable mention to the best group of parents a team could have for their support from day 1 to day GOLD!!! By eastyork|2014-04-01T10:09:29-04:00March 31st, 2014|Novice, Rep Teams|Comments Off on East York Novice Boys Win Gold at Provincial Championship!